Sound Bar connection and setup made easy. When it comes to getting better sound for TV viewing, the soundbar option is a definite favorite. Soundbars save space, reduce speaker and wire clutter, and are less hassle to set up than a full-on home theater audio system. However, soundbars aren't just for TV viewing. Depending on brand/model, you can connect additional devices and tap into features that can expand your entertainment experience. If you are considering a sound bar, the following tips will guide you through installation, setup, and use. 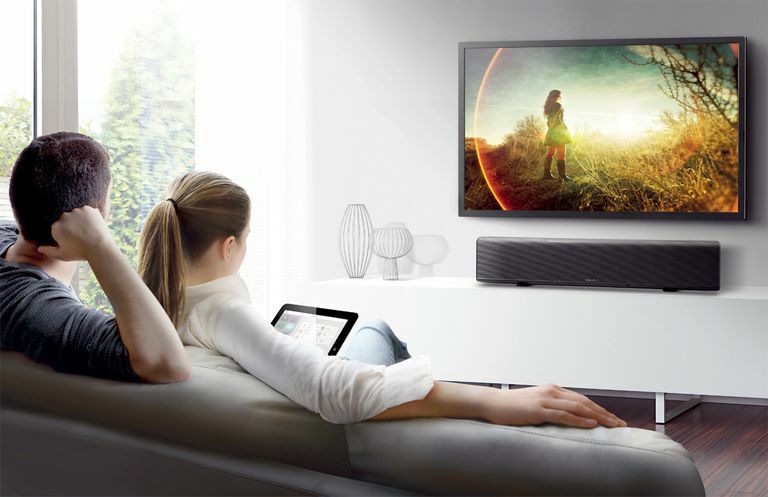 Soundbars can be used with televisions from a variety of manufacturers including, but not limited to, those made by LG, Samsung, Panasonic, Sony, and Vizio. If your TV is on a stand, table, shelf, or cabinet, a soundbar can be placed just below the TV. This is ideal since the sound will come from where you're already looking. You'll need to measure the height of the soundbar versus the vertical space between the stand and the bottom of the TV to make sure the soundbar doesn't block the screen. If putting a soundbar on a shelf inside a cabinet, place it as forward as possible so that sound directed to the sides is not obstructed. If the soundbar features Dolby Atmos, DTS:X, or DTS Virtual:X, audio capability, placing within a cabinet shelf is not desirable as the soundbar needs to project sound vertically for overhead surround sound effects. Most soundbars can be wall mounted. A soundbar can be placed under or above a wall-mounted TV. It is best to mount it under the TV as the sound is better directed to the listener. Many soundbars come with hardware and/or a paper wall template so you can find the best spot and mark the screw point for provided wall mounts. If the soundbar does not come with wall mounting hardware or a template, check the user guide for more on what you need, and if the manufacturer offers the items as optional purchases. Unlike the photo examples above it's best to not obstruct the front or sides of the soundbar with decorative items. Once the soundbar is placed, you need to connect your TV and other components. In the case of wall mounting, make the connections before permanently mounting the soundbar. Shown above are connections you may find on a basic soundbar. The position and labeling may vary. From left to right are Digital Optical, Digital Coaxial, and Analog Stereo connections, with their corresponding cable types. The digital optical connection is best for sending audio from the TV to the soundbar. If you find that the TV does not have this connection, you can use the analog stereo connections if the TV provides that option. If the TV has both, it is your choice. Once you have your TV connected, make sure it can send audio signals to the sound bar. This can be done via the TV's audio or speaker settings menu and turning off the TVs internal speakers (don't get this confused with the MUTE function which would also affect your soundbar) and/or turning on the TV's external speaker or audio output option. You may also have the choice of choosing digital optical or analog (this may be detected automatically depending on which is connected). Ordinarily, you only need to make the external speaker setting once. If you decide not to use the soundbar for watching certain content, you need to turn the TV's internal speakers back on, then back off when using the soundbar again. The digital coaxial connection can be used for a Blu-ray Disc, DVD player, or another audio source that has this option available. If your source devices do not have this option, they will most likely have a digital optical or analog option. One other connection that you may find on a basic sound bar, that is not shown in the photo, is a 3.5mm (1/8-inch) mini-jack analog stereo input, either in addition to, or replacement of, the analog stereo jacks shown. A 3.5mm input jack is convenient for connecting portable music players or similar audio sources. However, you can still connect standard audio sources via an RCA-to-mini-jack adapter that you can purchase. If using a digital optical or digital coaxial connection, and the soundbar does not support Dolby Digital or DTS audio decoding, set your TV or other source device (DVD, Blu-ray, Cable/Satellite, Media Streamer) to PCM, or use the analog audio connection option. In addition to the digital optical, digital coaxial, and analog stereo audio connections, a higher-end sound bar may provide the following options. HDMI connections enable you to route your DVD, Blu-ray, HD-cable/satellite box, or media streamer through the soundbar to the TV. The video signals pass-through untouched, while audio can be extracted and decoded/processed by the soundbar. HDMI reduces clutter between the soundbar and the TV as you do not have to connect separate cables to the TV for video and the soundbar for audio from external source devices. In addition, HDMI-ARC (Audio Return Channel) may be supported. This allows the TV to send audio to the soundbar using the same HDMI cable that the soundbar uses to pass video through to the TV. This means that you don't have to connect a separate audio cable from the TV to the soundbar. To take advantage of this feature, you need to go into the TV's HDMI setup menu and activate it. Consult your TV and soundbar user guides if needed, as accessing the setup menus for this feature may vary from brand-to-brand. Many sound bars include a subwoofer output. If your sound bar has one, you can physically connect an external subwoofer to the sound bar to produce the added bass for a movie listening experience. Although many sound bars come with a subwoofer, there are some that don't but may still provide you with the option of adding one later. Also, many sound bars, even if they provide a physical subwoofer output connection, come with a wireless subwoofer, which reduces cable clutter further (more on subwoofer installation in the next section). Another connection included on some sound bars is an Ethernet (Network) port. This supports connection to a home network that may allow access to internet music streaming services, and, in some cases, integration of the sound bar into a multi-room music system (more on this later). Soundbars that include an Ethernet port may also provide built-in Wi-Fi, which also reduces cable clutter. Use the option that works best for you. If your soundbar comes with a subwoofer, or you add one, you need to find a place to put it. You want to make sure that the sub is placed where it is both convenient (near an AC power outlet) and sounds best. After you place the subwoofer and are satisfied with its bass response, you need to balance it with your sound bar so that is not too loud or too soft. Check your remote control for separate volume level controls for the soundbar and the subwoofer. If so, it makes it a lot easier to get the right balance. Also, check to see if the soundbar also has a master volume control. This will enable you to raise and lower the volume of both at the same time, with the same ratio, so you don't have re-balance the soundbar and subwoofer every time you raise or lower the volume. There are some soundbars (mostly Vizio and Nakamichi) that include both a subwoofer and surround speakers. In these systems, the subwoofer is wireless, but the surround speakers connect to the subwoofer via speaker cables. The soundbar produces the sound for the front left, center, and right channels, but sends bass and surround signals wirelessly to the subwoofer. The subwoofer routes the surround signals to the connected speakers. This eliminates wire running from the front to the back of the room, but restricts subwoofer placement, as it needs to be near the surround speakers. On the other hand, select soundbars from Sonos (Playbar/Playbase/Beam) and Polk Audio (SB1 Plus) allow the addition of two optional wireless surround speakers that do not have to be physically connected to a subwoofer, although they still need to plug into AC power. If the soundbar provides surround speakers, for best results, place them to the sides about 10 to 20 degrees behind the listening position. They should also be a few inches away from side walls or room corners. If the surround speakers have to connect to a subwoofer, place the subwoofer near the back wall in the best spot for the deepest, clearest, bass output. Once connected, you not only need to balance the subwoofer with your soundbar, but you also need to balance the surround speakers so that they don't overwhelm the soundbar, but are also not too soft. Check the remote control for separate surround speaker level controls. Once set, if there is also a master volume control, you can raise and lower the volume of the entire system without losing the balance between the soundbar, surround speakers, and subwoofer. Another type of soundbar you might encounter is a Digital Sound Projector. This type of soundbar is made by Yamaha and is identified with model numbers starting with the letters "YSP" (Yamaha Sound Projector). What makes this type of soundbar different is that instead of housing traditional speakers, there is a continuous layout of "beam drivers" spread across the front surface. Due to added complexity, extra setup is required. First, you have the option of assigning the beam drivers for into specific groups to enable the number of channels you desire (2,3,5, or 7). Next, you plug in a specially provided microphone into the sound bar to aid the sound bar setup. The soundbar generates test tones that are projected into the room. The microphone picks up the tones and transfers them back to the sound bar. The software in the sound bar then analyzes the tones and adjusts beam driver performance to best match your room dimensions and acoustics. Digital Sound Projection requires a room where sound can be reflected off walls. If you have a room with one, or more, open ends, a digital sound projector may not be your best soundbar choice. Another variation on the soundbar is a Sound Base. A sound base takes the speakers and connectivity of a soundbar and places it in a cabinet that can also double as a platform to set a TV on top of. Placement with TVs is more limited as sound bases work best with TVs that come with center stands. If you have a TV with end-feet they may be too far apart to place on top of a sound base as the sound base may be narrower than the distance between the TV's end-feet. The sound base may also be higher than the vertical height of lower bezel of the TV frame. If you prefer a sound base over a sound bar, make sure you take these factors into consideration. Depending on the brand, a sound base may be labeled as an "audio console", "sound platform", "sound pedestal", "sound plate", or "TV speaker base". One feature that is very common on many sound bars is Bluetooth. This allows you to stream music directly from your smartphone and other compatible devices. Some sound bars also allow you to send audio from the soundbar to Bluetooth headsets or speakers. Another feature included in some sound bars is wireless multi-room audio. This allows you to use the soundbar, in conjunction with a smartphone app, to send music from connected sources or streamed from the internet to compatible wireless speakers that may be located in other rooms in the house. The soundbar brand determines which wireless speakers it can work with. For example, the Sonos Playbar will only work with Sonos-compatible wireless speakers, Yamaha MusicCast-equipped sound bars will only work with Yamaha-branded wireless speakers, Denon sound bars will only work with Denon HEOS-branded wireless speakers, and Vizio sound bars with SmartCast will only with SmartCast-branded speakers. Sound bar brands that incorporate DTS Play-Fi, will work across several brands of wireless speakers, as long as they support the DTS Play-Fi platform. Despite not being equivalent to a full home theater setup with a receiver and multiple speakers, for many, a soundbar can provide a satisfying TV or music listening experience – with the added bonus of easy set up. For those that already have a large home theater setup, soundbars are a great solution for second room TV viewing. When considering a sound bar, make sure you just don't look at the price, but the installation, setup, and use options it may provide that can deliver the best possible entertainment bang for your buck.